Three villages for you today, the still unheralded Fixin is the first. It has been in the doldrums for a long time, with most of its representation in the UK coming from growers elsewhere who married or inherited a bit, or from completist negociants. The wines haven't always been the finest ambassadors for the terroir. Now though, the village has a new flagship producer in the shape of Berthaut-Gerbet. Firmly Fixin-based, Amelie Berthaut has singlehandedly raised the profile of the village more in the last three years than anyone else in the previous 50. 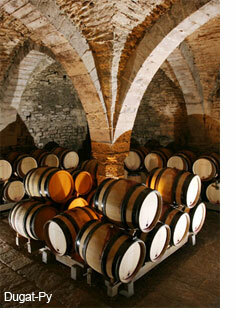 Unlike last year we do have a little to offer, which is rather a nice opportunity for Burgundy lovers. Gevrey-Chambertin provided one of the top three highlights of my life, in or out of wine. A tasting at Dugat-Py is difficult to come by but more difficult to process. It was, to retreat into a totally unsuitable metaphor, like a fireworks display by the Royal Horse Artillery; agile, mobile, packing a punch, and with one showstopper after another. In fact I began to get almost suspicious about the ever-increasing intensity and richness, even though these traits were cut by real acidity and minerality. It is a common misconception that Dugat-Py can't be drunk for years after the vintage. This is no longer true. For the last ten to fifteen years the wines have been much more accessible, though decanting the youngsters would be good. This was a terrific and quite dramatic tasting.